The Sustainable Run for Development-SURUDEV, a not for profit organization based in the North West Region is entering into records in great names. This is so due to the impact SURUDEV is creating through its Sustainable Bio Demonstration Farms located in Bongom, Donga Mantung Division. 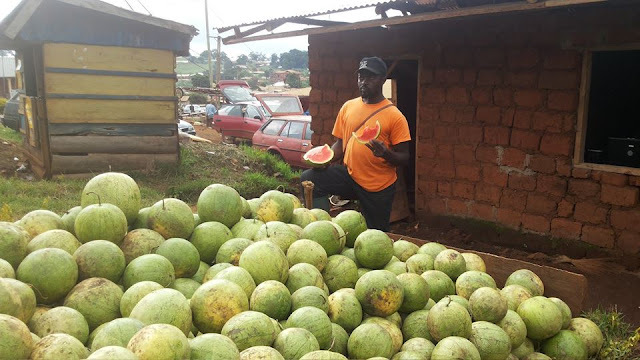 The farms which habours onion, okro and especially watermelon is at the center of attraction thanks to its uniqueness and innovative approaches. 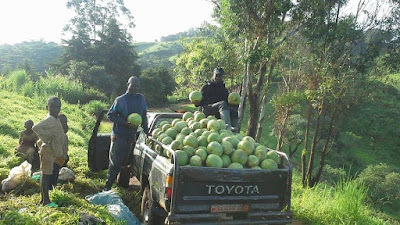 The population of Nkambe town was taken aback when a truck load of watermelons surfaced in the market. The quality and quantity attracted both buyers and admirers. 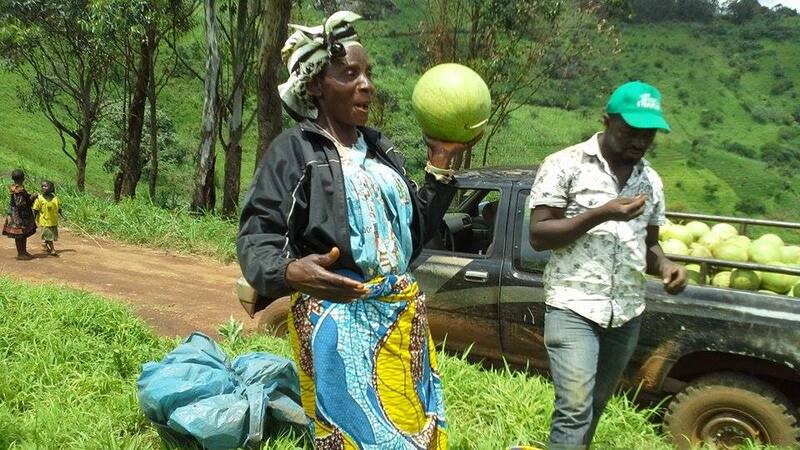 Eye-shopping and inquisitiveness reached its apex when information filtered around that the fruits were not imported into the Division but were just produced in the nearby Bongom village, in Nkambe Central. What was however so interesting was the taste and the quality of fruits says Mary Awudu. "I could not believe these fruits are from Bongom" she concluded. Like irish potatoes, beans and maize, watermelon is gaining grounds in the North West Region. 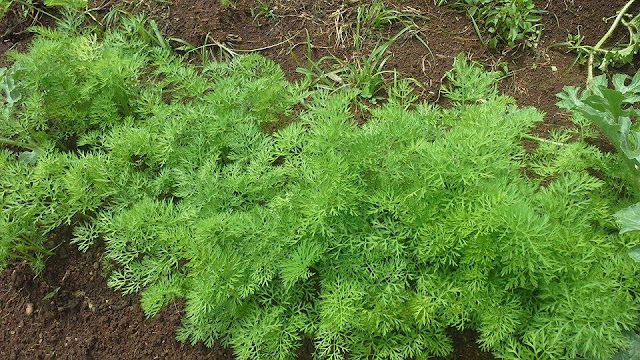 Donga Manung Division has been in the cold since the invasion of this highly market potential farm produce. Munkwa Victor Fon is one of the experienced farmer who is farm manager at SURUDEV Sustainable Bio Demonstration farms. " I have worked on a watermelons farm in the Littoral region, so when I came back home, I tried some few plants and the result was wonderful. 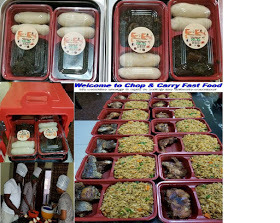 The flavour was great and that is how we launched this demonstration project". This cool juicy refreshing fruit is gradually becoming a favourite at meals. It is found at almost every outdoor party and in most food markets. For the first time in Donga Mantung Division, such fruits found selves in villages. Statistics show that Cameroon was one of the main producers with a total production of 28000 tons in 2002. 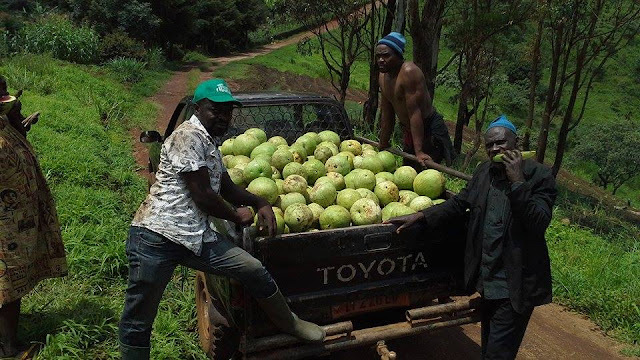 Presently, although little information is yet available on the production of watermelon in Cameroon, the Donga Mantung has always been one of the areas with no production. No one thought of taking this earlier risk and not to talk of breaking the myth. During the last few weeks, most young men and women in Donga Mantung Division have confessed they would like to be trained in the techniques. SURUDEV's Jackson says they are ready to share their experiences in the “stress free cultivation of watermelon”. This is a local method that farmers will be trained on-farm and implicitly, the method will provide excellent results. The good yield coupled with improved techniques on marketing agricultural produce results in better income for the farmers and thus potential for watermelon business to foster a green economy. This is inline with SURUDEV efforts to promote agroforestry and at the same time sustaining its activities in the field. On whether it is profitable, he revealed that the project is on a good footing. "Generally, the benefits will not be much but it will be two times much better than someone who cultivated maize and or beans. 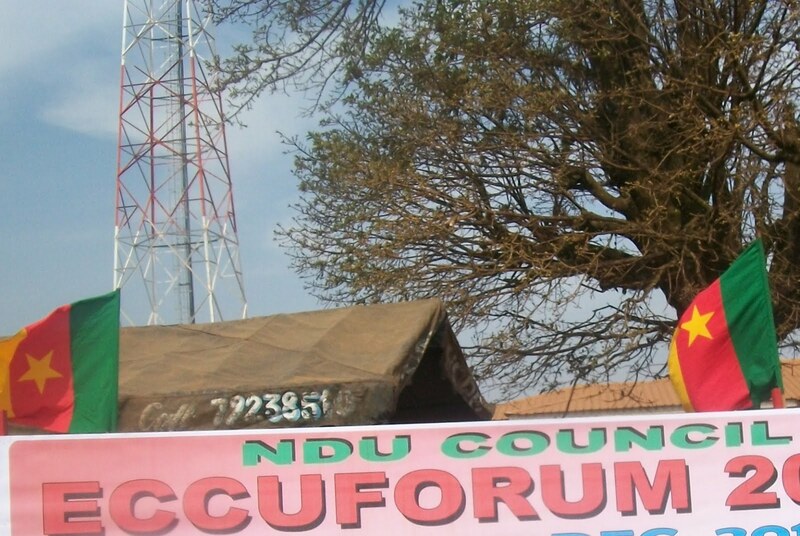 We have a ready market, we were at the Nkambe market, Kumbo and the next market day we will be in Ndu" Kari Jackson said.". The visit to SURUDEV Sustainable Bio Demonstration Farms, Bongom, ignited optimistic views and dashed doubts that the project will go a long way to change the mentality of the people of Donga Mantung Division. Kari Jackson said the idea of setting up the watermelon and onion farm is to stimulate youths into agricultural activities. “The population should be aware that we turn to waste alot of land to cultivate nothing. A farmer can sell watermelon and or onion to buy maize”. He also emphasized that when harvesting will end by July training of youths and women will start by August. 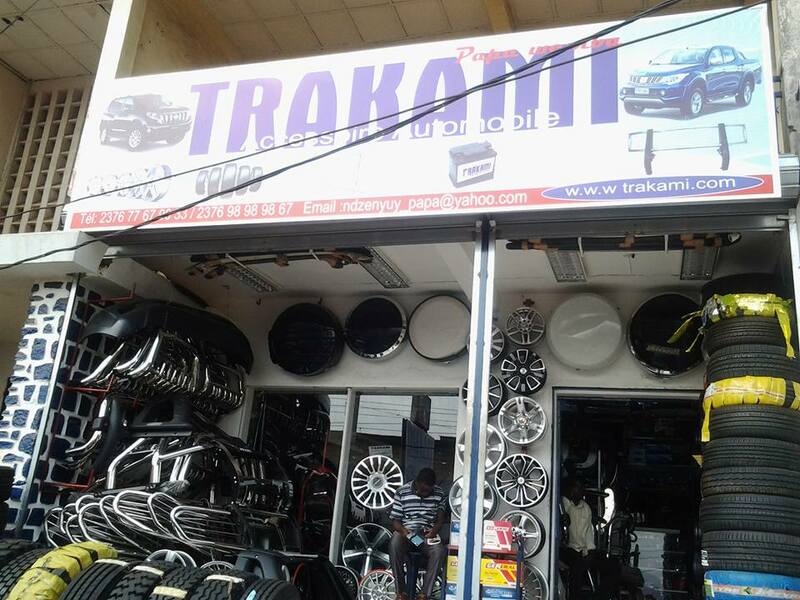 "We are actually into marketing and we are looking forward that retailers should come and buy from us on the spot". Munkwa Victor on the other hand disclosed to this reporter that since they started harvesting, the number of people that come just to see whether it is true that watermelon is cultivated in Bongom is about 15 per day. Harping on the importance demonstrating to the farmers that they were ignorantly sitting on a goldmine, Kari Jackson said that they intend to train atleast 10 to 15 youths every year in the demonstration farms. “We want to change the mindset of women and youths towards farming”. Sustainable agriculture he insisted provides high yields without undermining the natural systems and resources that productivity depends on. In the case of the watermelon and the onion farms, Kari continued that the farms will serve as traning centres for other farmers. On why SURUDEV is going biom Kari outlined that the approach works efficiently with natural processes rather than ignoring or struggling against them – and use the best of current knowledge and technology to avoid the unintended consequences of chemical based agriculture that would destroy the soil. "We are trying to show to farmers that they can be able to minimize the use of pesticides and fertilizers, thereby saving money and protecting future productivity, as well as the environment", he continued. According to SURUDEV Coordinator, the soil is arguably the single most prized element of agricultural ecosystems. Healthy soil he added teems with life, including many beneficial microbes and insects, but these are often killed off by the overuse of pesticides. " When we launched the agroforestry project, the whole idea was to improve on the soils that can lead to improve yields and produce robust crops less vulnerable to pests. We have tested EM products and this is the results". In the next few months, the demonstration farms will start the marketing of okro, pepper and garlic while transplanting is going on the onion plot estimated at about one ha of land. The 2018 presidential polls offer yet another chance for Cameroonians to choose their president (executive)! Should it be successful as obtained in meaningful countries within and without Africa, then we will have a people’s government especially if subsequent subordinate elections (legislative, municipal …) follow the same trend, of success. An elected Cameroon people’s government will accelerate development and progress for these elected representatives will be accountable to the electorate thus speeding up advancement unlike had been and is the case. This is the practice of all progressing nations world wide. For a successful succession, history shows that denizens of the involved nations or communities ensure that democracy is not only said to be practised but seen to be practised. Democratic structures (unanimously accepted constitution, electoral code, separation of powers ...) are put in place long before elections season. 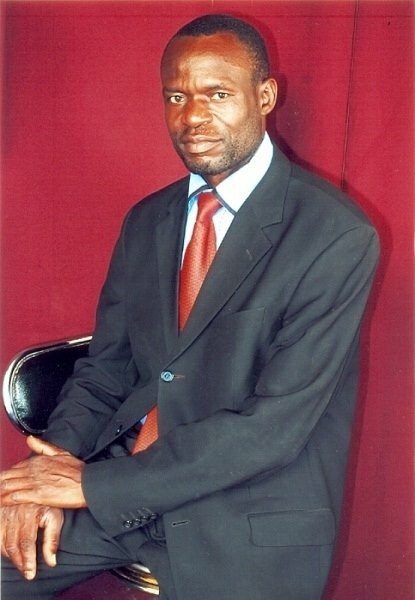 Informed by CATTU goals and works, this open request is served on you to achieve the potential synergy with the Nyamusa for 2018 Cameroon Presidential campaign so as to,amidst other ills, avert the impending deadly clash between the growing impatient democracy thirsty population and the traditional elections rigging machinery of the incumbent CPDM (formerly CNU) regime. The Nyamusa for 2018 Cameroon President campaign team has as aim and believes that a rainbow coalition of all progress forces of the nation which include political parties, civil society, clergy… will completely uproot the over 50 years autocracy of the CPDM (former CNU) - hence this invitation to your organization, sir. We yearn for a favorable reply. For the utmost benefit of all Cameroonians particularly the downtrodden and youths, I, Felix Teche Nyamusa, SDF 2018 Presidential hopeful (pending primaries) write on behalf of the Nyamusa for Cameroon President campaign team to solicit for close cooperation with your labour union within her area of competence to ensure democracy and good governance in Cameroon ahead of the all important 2018 presidential poll. YA TUMI LA'AKA Catherine, mother of Cardinal Christian Tumi, will be buried on June 27, 2015 in Kumbo. She died on 8, 2015. She left this world at the venerable age of 118 years. Born in 1897, she had crossed three centuries. 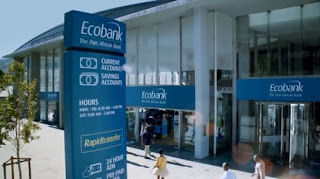 The Pan-African banking group, Ecobank, will soon enjoy the services of Mastercard, the electronic payment giant, after the signing of an agreement between the credit card company and Ecobank group on June 15, 2015. The agreement between the two partners provides for the issuance of thousands of credit card machines to major distributors such as supermarkets. In Cameroon, the Ecobank subsidiary joins other companies such as Afriland First Bank and Banque Atlantique on the Mastercard network. However, these banks also use Visa, Mastercard’s competitor. Ranked the fifth bank in Cameroon, Ecobank Cameroon’s 2014 net results reached 6 billion FCFA, which is an increase of 51% relative to 2013 when the bank’s net result grew by 154%. Officially presented on June 17, 2015 in Yaoundé, the last report by the National Monitoring and Implementation Committee for the Mining Industry Transparency Initiative (ITIE), reveals that, in 2013, the mining sector generated 830 billion FCFA in total sales, which is 5.4% of the country’s GDP. This revenue was, however, down by 2% compared to 2012. As is customary, these earnings were primarily generated by the oil industry, which is currently the country’s most dynamic, structured sector. According to ITIE figures, Société nationale des hydrocarbures (SNH), the State’s oil mining company, generated over 500 billion FCFA in revenue , against 202 billion FCFA for 14 other oil companies which were examined by the ITIE’s national committee. 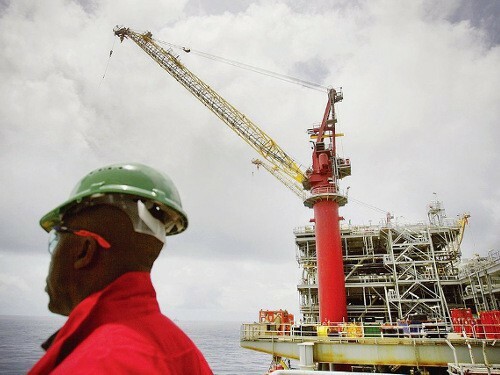 The report, however, reveals new sources of wealth for Cameroonian exports. These include diamonds, sapphires, marble, granite, limestone, clay and gold which are currently in quantities that are still considered to be insignificant. The heavy down pour of the rains last weekend in the economic capital Douala was a dilemma many inhabitants of that city. Reports say the heavy rains resulted to the demise of three kids and about 1500 persons were rendered homeless. Property lost in various homes as well as a local company which was affected by the heavy rains is estimated at about FCFA 60 million. Douala 5, we gathered recorded the highest number of victims. Littoral Governor, Joseph Beti Assomo is said to have held an emergency meeting to assess the situation and take necessary measures to mitigate any recurring incident. As one of the strategies, Littoral Governor is said to have warned the population to stop the throwing garbage in the gutters. He also recommended to Dr. Fritz Ntoné Ntoné, government delegate to the Douala City Council (CUD) to intensify the cleaning and maintenance of gutters in the city. 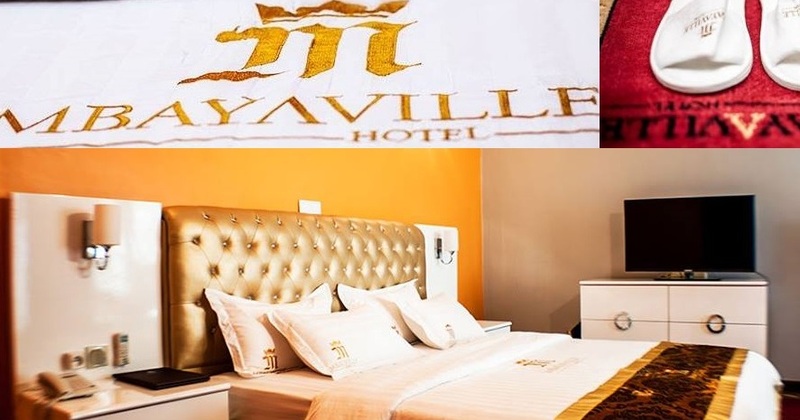 Popular opinion in Douala is pointing accusing finger at poor treatment of household waste by HYSACAM, the company that is incharge of cleaning the city and managing household waste. This poor practice is observed in large and highly populated cities like Douala and Yaoundé, where urbanization has swallowed up all the green spaces. Poor construction of houses and the inability by HYSACAM to recycle waste household is also a cause for concern many say. Former Minister of Public Works and formerly Member of Parliament, Dieudonne Ambassa Zang was found guilty by the Special Criminal Court for embezzling state funds. Dieudonne Ambassa was found wanting for embezzling a huge sum of FCFA 5.8 billion while he served as minister of public works. 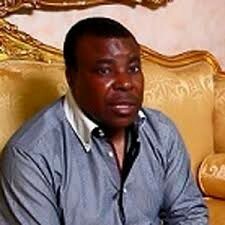 Tongues are waging as to how a single person could siphon close to FCFA 6 billion. However, expressionists say it is easy given that the ministry of Public Works takes care of big projects, such as road construction projects worth FCFA billions.However, Ambassa Zang who is now out of the country is quoted to have said that it jail term is a plan to destroy his political career. This former militant of the CPDM escaped to Europe. Yet he allegedly said that he is being wanted for his political activism by the regime he served in several capacities. Classified sources have hinted us that Prof. Tafah Edukat Edward, Vice Chancellor of the University of Bamenda has replied to the letter by Minister of Higher Education instructing UBa officials to absorb HiTL students who were chased out of Campus. 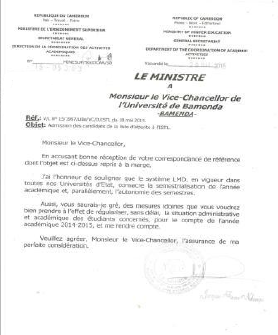 In his letter which some officials of UBa described as gross insubordination, Prof. Edukat is reported to have told Fame Jacque Ndongo point "blank" that he can only absorb these students next year. The students we gathered have released names of some studentswho they say were obnoxiously admitted into the Higher Institute of Transport and Logistics by UBa officials. A source in the Ministry hinted that the Minister is aware that the VC had earlier told students to talk to the minister to come over an run the school. An atmosphere of uncertainty now looms at UBa as the students have been informed of the letter to the Minister. Strike threats hover at the University of Bamenda-UBa as some students of the Higher Institute of Transport and Logistic (18) have been ordered by the Vice Chancellor Tafah Edukat Edward and Teguia Alexis, the Director of HiTL to pack their belongings and quit the campus or else face the unexpected. Although the Minister of Higher Education, Jacque Fame Ndongo had in a correspondence instructed UBa officials to admit all the 20 students on the waiting list, the call seems to fall on deaf ears. The story goes that the students (20 of them) were admitted on the waiting list (per the policy of UBa) and were asked to attend classes while waiting for the minister to visa the list authorizing their final admission and registrations. Since January 26, these students we were reliably informed have been attending classes. Last May 28, 2015, the Minister of Higher Education in response to letter No 15/1997/UBa/VC/D/ISTL of May 18, 2015 titled “Admission of students on the waiting list into HiTL” instructed the Vice-Chancellor to admit the students (20) for the academic year 2014/2015 given that with the LMD system, each semester is independent. In that same letter, Minister Jacque Fame Ndongo emphasized that the admission should be done with immediate effect and that he should be informed latter. Our Investigation revealed that the minsiter’s letter was recieved at UBa on June 3, 2015. Matters came to a head when the (18) students were told to leave the campus or face the rage of the police. This was when their peers were writing end semester exams. Tears, anger and frustration took the centre stage when the students discovered that after having attended school now for the past three months (renting houses and incurring other expenditures) the director of HITL has now forbidden them from writing the end of semester exams. The question on every lip at UBa is whether there is some battle somewhere that the innocent students are being thrown into the street given that the habit in UBa is (and has been) to take all those on waiting list ( even for schools with automatic employment after graduation. Why then should HITL - with no automatic employment after graduation be an exception, many have questioned. In a bit to find out the truth, this reporter rang the Vice Chancellor’s phone twice. In a hysterical effort to explain why he is recalcitrant to his boss’ instruction, Prof. Tafah Edukat Edward said that he told the students to go back home and that they would be given pride of place next year. He also added that with already 99 students, the Director of HiTL told him that there is no space to accommodate more 18 students given that it is a professional institution. He also emphasized that the students had not written the first semester exams and that it would be difficult for UBa to get places where they could carry out their internship given that interns are supposed to be in the field by July this year. However, when this reporter contacted him on phone the second time, Prof. Edukat said he would find a solution was short to say which and how soon. “When it will be done, I will inform the Minister” he concluded. When this reporter rang the Director of HiTL, Dr. Teguia Alexis to get his own side of the story, he simply responded that he was attending a ceremony and could only be available on Monday. PC Ntanfoang Bali Bubbles; Church Seal! Is The African Union only in a Name?